Punjab government announced great jobs in all Hospital in Punjab 2019 A number of jobs have been announced in Punjab's Tehsil Headquarters Hospital, Tehsil Primary, And Secondary Healthcare Department. 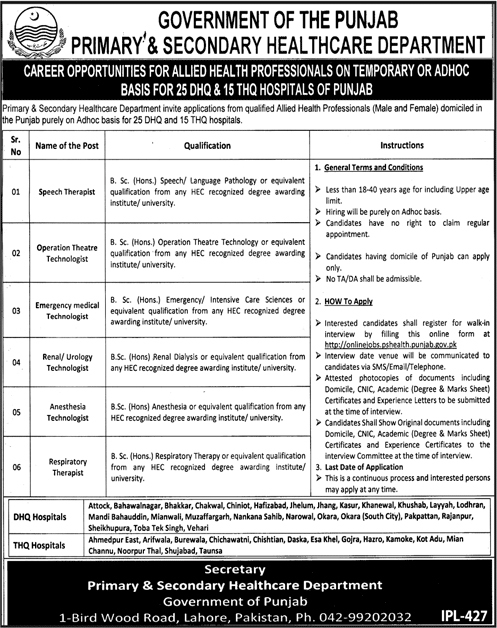 Primary & Secondary Healthcare Department invite applications from qualified allied health professionals (Male/Female) domiciled in Punjab purely on adhoc basis for 25 DHQ and 15 THQ hospitals. If you want to work in the hospital and have been looking for a job for a long time then this article is only for you. About 240 jobs have been announced in the hospitals by the Punjab Government. You can do this job in all cities across Punjab. I will guide you through this job. Less than 18-4- years age for including upper age limits.